Will leaving the EU affect graduate employment? It seems as though all this Brexit speculation is never going to end, one day we hear we’ll be better off remaining, and the next day the news tells us how things would be better if we left the EU. Recent polls seem to indicate that we are heading for an out vote, but a new survey indicates that leaving the EU could spell disaster for graduates looking for employment. 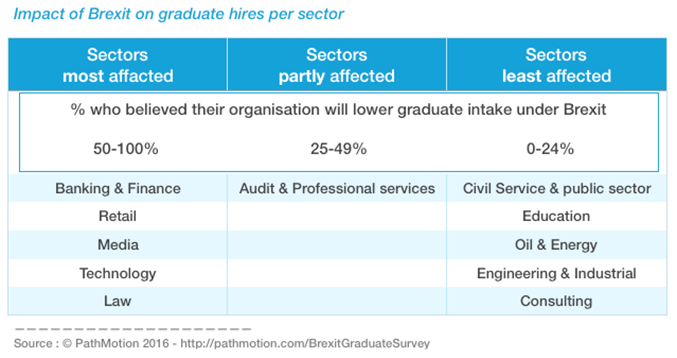 Half of the leading graduate employers in the UK will reduce their graduate intake if Britain votes to leave the EU, according to a survey of top UK graduate employers by PathMotion. The research found that if the UK votes to leave the EU, the sectors most at risk of downsizing their graduate intake are Banking & Finance, Retail, Media, Technology and Law. These sectors, together with audit and professional services employ over 50,000 graduates per year. The three main reasons cited for downsizing graduate hires under Brexit are: the impact of Brexit on the economy and therefore on the volume of business; general uncertainty about the future; and a lower talent pool of EU graduates applying for jobs. “The graduate intake under Brexit would be lower due to the negative impact on the economy, especially in the City” - senior partner at magic circle law firm. While some firms would increase the hiring of British graduates to compensate for fewer EU graduates, the majority reported they would either apply for work permits to maintain current levels of EU graduates or reduce operations in the UK to manage with fewer graduates. Some firms reported that hiring more Brits for jobs currently held by EU graduates could impact on overall quality. ·The need to be able to tap into a wider talent pool (cited across all sectors). See the full results of the graduate employment survey. Would this be enough to sway you to vote remain next Thursday? Fill out our 30 second EU Referendum poll and tell us what you think.